The Other Mike and I biked near and around Lake Pepin two weekend ago. Great riding. That’s me above somewhere in Sconie along the Eastern shore of Lake Pepin. If my memory serves me right, that’s somewhere after Maiden Rock. Day 1: We drove to Lake City, parked Mike’s car on a side street near some folks who were sitting on lawn chairs in their driveway drinking beer. Neighborhood watch. From there, we rode uphill away from the Mississippi to Zumbro Falls (more bars than people in this cute little town) then to Mazepa (painted fake cops patrol the highways and streets of this town), and North to Red Wing through Hay Creek Township. We spent the night there, had some German food & a few beers. We pulled him into Nelson where we all stopped for ice cream cones and discussed how lucky Minneapolis is to have a mayor who buzzes around down town on a Nice Ride bike on his way to food trucks. He brought it up. Then he continued south toward Trempealeau. After Nelson, Mike and I crossed back into Minnesota at Wabasha and worked our way north in the shade of the bluffs along Highway 61. The highway, at that point, has a steady flow of traffic, but a wide shoulder and speed limits between 45-55, which felt very comfortable. Both sides of Lake Pepin were very bike friendly. If you want to take your time, you can stop at a zillion biker bars on the Wisconsin side. And, there are a ton of wayside rests, historical markers, and other scenic stuff to check out. If you wanted to foodie it up, stop at The Harbor View Cafe in Pepin for lunch, Nelson’s Cheese for a picnic of wine and cheese or an ice cream cone, Pepin Heights for some apples, and Nosh (warning, really crappy website with sound) in Lake City for dinner. That would be a very full day of riding and dining. An awesome day. I’m jealous. Do you have any more pictures? And what is/are Spotted Cows? This sounds awesome. I wanna do it, too. except for the no-joke hill. 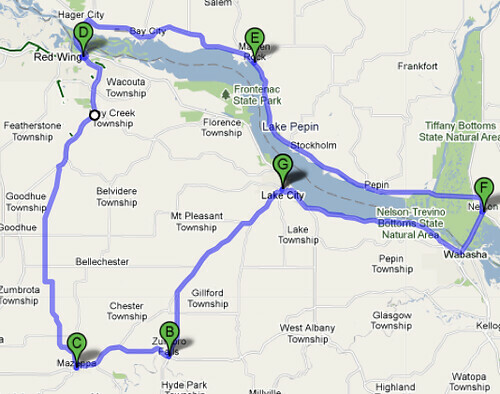 So, why did you decide to go through Zumbro Falls and Mazepa instead of just heading straight to Red Wing? @Terry, here’s the Spotted Cow. If you click on the pictures, you should be able to see a few more from the tour on Mike’s Flickr account. @Reuben, game day decision. We has considered heading to Northfield on Day 1, then back through Cannon Falls on the Cannon River Trail but mixed it up. In the end, I think it was a good choice because Lake Pepin was awesome to go around and the Cannon River Trail can be a bit congested on the weekend. It’s a bit narrower than similar rails to trails, and quite popular. Four Firkins staff told me New Glarious doesn’t export Spotted Cow outside Wisconsin. They recommend Lift Bridges Farm Girl Saison for those seeking something similar. I wouldn’t consider Farm Girl Saison all that similar to Spotted Cow, but excellent in a different way. Spotted Cow, to me, is an excellent ale for when it’s too hot for a Summit EPA. 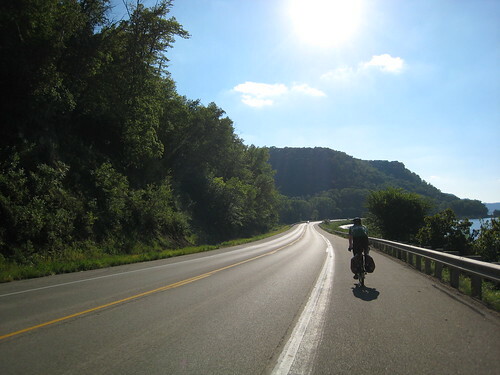 The first photo above was actually taken about 5 miles south of Lake City MN near the end of the ride; Hwy 61 bent to the west following the bend in the MS river which is why why the sun was straight above us going down that hill. –There’s the topo map of the no-joke hill…fitting that they put the cemetery at the top, eh? It wasn’t as long as those 45 minute long climbs in OR a few years back, but I was in better shape then too. Next tour I’m getting into better shape so I can enjoy it more, I was on fumes at the end of each day which was a drag on both of us.